Gelato, an Italian-style ice cream, is the perfect dessert on a hot Texas day. Even on the chillier days, this delicious creamy treat is ideal. Stop by any of the following 10 gelato shops for our favorite treats in Texas. Sweet Cup in Houston, Texas, has been in business since 2012 and boasts over 200 flavors. They now have two locations, including one in the Montrose and one in the Oak Forest areas of Houston. Teo Gelato’s flavors are available throughout the country, but the best way to experience their gelato is with a visit to their Austin café. They were the People’s Choice Award at the Chicago World Tour in 2016, and have won many other accolades throughout the years. Rio De Gelato sells delicious pizza and gelato in San Antonio. The gelato is made with a family recipe perfected over six generations. Stop in or call ahead for today’s flavors. Epic Gelato is celebrated its two-year anniversary last January. They sell specialty coffee and gelato made daily. They’ve won the Best of Denton County award for the last two years. Zenzero Artisan Gelato offers small batches of home-made gelato. Flavors change regularly but regardless of the flavor, customers can always count on zero preservatives, zero artificial colors, and zero artificial flavors. The Gelato Cone in Allen, Texas, uses the same family recipe the owners started using in 1956. They offer gelation one, two, or three scoops. Try it with a waffle cone. 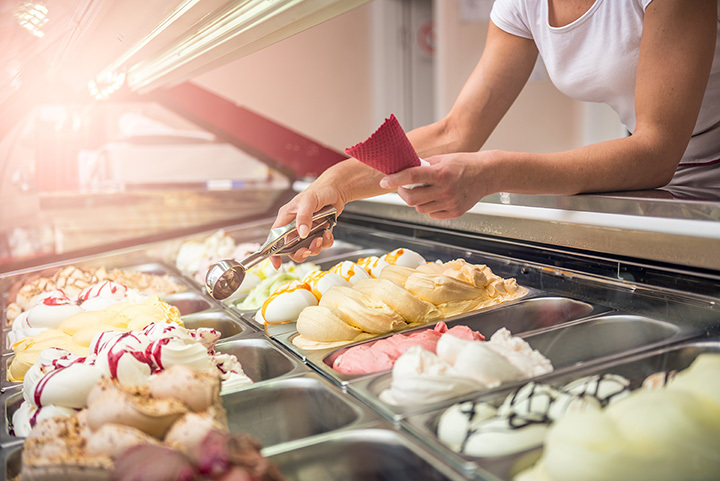 Katy, Texas, is home to La Argentina Gelato, a seasonal gelato spot with delicious flavors including vanilla bourbon, French vanilla, salt caramel, and many more. They deliver, so there’s no excuse not to indulge. Taste and See of Texarkana, Texas, is a gourmet chocolate, coffee, and gelato shop. With over 40 flavors including white chocolate peppermint, green apple, butter pecan, and cherry vanilla, you always have a reason to stop in. Funnel Cake and Gelato: A match made in sugary heaven. If those two items aren’t enough for you, consider trying their deep-fried Snickers, deep fried Oreos, deep fried Twinkies, Kool-Aid pickles, cotton candy, and more. A La Mode Gelateria Dessert and Snack Bar in Corpus Christi has been featured on the Food Network for their awesome treats. Try their gelato filled doughnuts for something truly unique.